Posted December 18th, 2012 by David Porter & filed under Hot Topics, Social. News on how politics and the season still keep clashing, however cold it is and whatever else goes on. Party political hostilities usually shut down for the actual festive season as Parliament enjoys an all-party Carol concert and then adjourns. After all, voters want some respite over the family days of gift opening. Hostilities normally resume with the New Year messages from the leaders. This year, Christmas itself has prompted another of political arguments and controversies, over and above the rows within many homes over politics, money, religion, relatives and relationships. At a time of continued austerity and public sector ‘spending cuts’ or ‘realignments’, the amount of money around is a big issue. The more people have in their pockets, the more they spend, so the economy is boosted, so the theory goes. 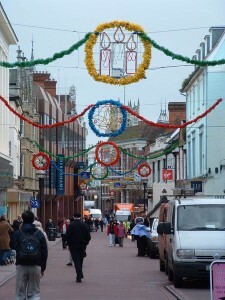 A survey by MoneySupermarket.com in late November reckoned that consumers would spend an average £445 on Yuletide in 2012. Children were expected to pull in presents worth an average of £132. The poll also found that almost half of all parents felt under pressure by adverts, hype and peer pressure to spend more than they can actually afford. The actual spend is up 1.8% on a year ago, so economically, things must be on the up. But politics is the half-empty/half-full game, with perceptions depending on whether you support the government of the day or oppose them. After the government relaxed Sunday trading restrictions from 22 July to 9 September so that retailers ‘could take advantage of the unique opportunity that the Olympics and Paralympics Games presented’, some of them are back demanding more. Like latter-day Olivers asking for more workhouse gruel, the CEOs of Morrisons and Asda led the charge to persuade the government to give a couple of extra hours opening time on Sunday 23 December this year, as they will in the main not be open on Boxing Day, 26th. 23rd is expected to be this year’s busiest shopping day, and they want just a couple of hours extra. They say. ‘it’s not like we’re asking for 24 hours….’ Of course in the normal week many bigger supermarkets do open round the clock and accept only 6 hours of business on Sundays, so what’s different about Christmas? There have been restrictions on Sunday opening hours in shops, pubs, clubs and some other activities for decades. Since the 1950s various sectors secured exemptions on location, floor area or products being sold. Tourism was served. But it was a fragmented set up, often widely different from council to council. In 1994 a new law regularised matters. It was a compromise between free traders who wanted unfettered access to shops, and Keep Sunday Special supporters who wanted it kept free of rampant commercialism for religious and/or family reasons. It protected shop workers from excessive exploitation. It broadly worked. Many people thought and/or wanted the government to regard the Olympic relaxations as an experiment and enshrine them in new law later. That isn’t going to happen soon. The internet changed everything with its 24 hour we-never-close shopping. Now the debate in political circles is all about preserving a viable high street with Mary Portas type ideas and gimmicks, and an argument that says online is the future and malls are but showrooms. There are benefits and there are disadvantages. Many of the internet international giants like Google, Amazon, Starbucks have reduced their business tax bills in the UK which has caused outrage and so become yet another political hot potato. 40% thought ‘Christmas is about celebrating that God loves humanity,’ and according to Spencer about the same number said they thought that it was ‘a good excuse for taking time off but doesn’t really have any meaning today. No parallel studies yet for 2012 to see if attitudes have changed. But the facts remain that Christmas political issues include economics, homelessness, enough to eat, heating costs, employment/unemployment, religion, charity, taxes, healthcare, public services, troops serving away, war and conflict, refugees, education and political correctness. Spencer concluded that ‘Christmas is, and will remain, a time when most of us down tools and try to close the door upon the world’. The Christmas story, which still provides the contours of the season, challenges us to take questions of social alienation, political oppression and economic injustice very seriously indeed. And if you think you can shut yourself away from it, just turn on your TV, radio, PC, smartphone, tablet or access news and social media. The world goes on revolving. How Long Do We Need to Shop for Christmas?